Is there any point in searching for the origin of life when so many diseases are yet to be beaten? What is the point of research? Is it to understand the origin of life? To explain gravity? To find a cure for cancer or prevent Alzheimer’s Disease? It may not be immediately obvious, but each one of these valid research questions actually belongs to a different subcategory of research, basic or applied. This may seem like a fine distinction, but it actually has extensive implications. For example, if you were the head of a foundation and had to choose between allocating funds to each of these questions, which of them would you prioritise? Most people would put their money where their health is. It is hardly difficult to convince anyone of the urgent need to find a cure for cancer. But is that the right way to go? 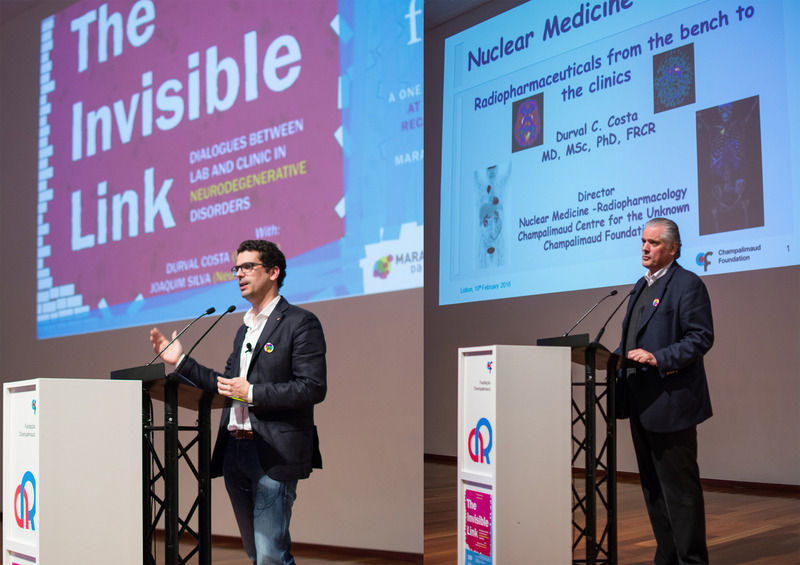 According to the organisers of the Ar | Respire Connosco event “The invisible link: Dialogues between lab and clinic” , the answer to this question is not exactly simple. In late 2015, Maratona da Saúde, a Portuguese initiative that raises funds to promote clinical research, approached the Champalimaud Research (CR) to collaborate in their 2016 fundraising campaign. The initiative focuses on a different type of disease each year and this year it selected neurodegenerative disorders, such as Alzheimer’s and Parkinson’s disease. Contrary to applied clinical research, which focuses on the development of practical solutions, such as treatments and cures for diseases, basic research asks fundamental questions without an applied purpose in mind. This made Maratona’s request a bit surprising. The CR is a basic research programme, where scientists address questions such as how memories are stored in the brain, or how the brain generates coordinated movement, rather than identifying cures for neurodegenerative diseases. And yet, Maratona specifically asked the CR to organise an event for the general public on neurodegenerative disorders. What is the link, then, between Maratona da Saúde and the CR? Daniel Nunes (Figure 1), a postdoctoral researcher at the CR, and Liad Hollender, a member of CR’s science communication office, accepted the challenge. “Since we are both neuroscientists, we are familiar with the biology of neurodegenerative diseases. At the same time we know, as many people do, that there are still no cures available for any of them. So when we heard about Maratona’s request, we felt compelled to support their campaign, but we weren’t sure about the best way of doing it.” they recall. Figure 1. Daniel Nunes during the event, giving the introductory talk. Together with Ar | Respire Connosco, a volunteer-based science communication initiative at CR that organises free events for the general public, the pair quickly realised that CR’s natural connection to Maratona da Saúde came from the often overlooked relationship between the need for a cure and pursuit of curiosity (Figure 2). In other words, this connection spurred from the relationship between clinical and basic research. During the Ar event, “The invisible link: Dialogues between lab and clinic”, this relationship was explored from different angles (Figure 3). Figure 2. One of the highlights of the Invisible Link was an interactive exhibition, featuring the work of CR researchers (left and center) and stations by Maratona da Saúde, Patient Innovation (right) and Dançar com Pk. Figure 3. Dr Joaquim Alves da Silva (left) and Dr Durval Costa (right) were the two main speakers of the event Invisible Link. Both are medical doctors. Joaquim is currently completing his PhD thesis at CR in basic research and Durval is the head of the Nuclear Medicine Unit at the Champalimaud Clinical Centre. “At the same time, though, we do know that we wouldn’t be living in the world we in live in today if it weren’t for basic research discoveries in various fields that were connected in unlikely ways, sometimes with centuries in between the time of discovery and its eventual application.”, adds Liad. 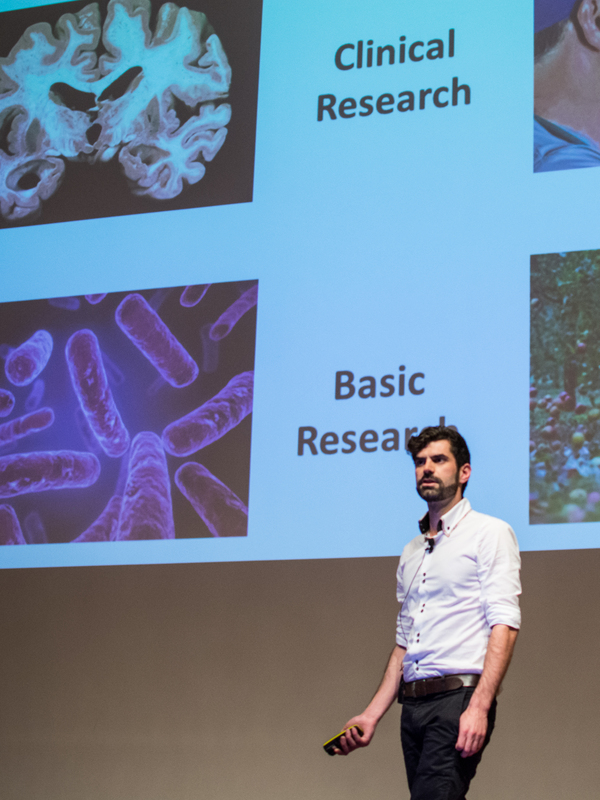 “There are many examples of this, including those that were presented in the event, discoveries that were essential for the diagnosis and treatment of neurodegenerative diseases.” says Daniel. “But we would be lying if we said that we believe the only point of basic research is to provide the knowledge necessary for progress. Each one of us became a scientist because we wanted to understand how the brain works. It was the mystery that we found irresistible.” Liad and Daniel admit. VIDEO 1.Event introduction by Daniel Nunes. VIDEO 3. Joaquim Alves da Silva:past breakthroughs in medicine that would not have been possible without basic research and current basic research innovative tools in that might lead to the breakthroughs of the future.